Giancarlo Stanton rounding third base on one of his home runs Thursday night. @Yankees. The Yankees took three out of four in their series with Tampa Bay, and, barring a collapse in Boston this weekend, will be hosting the Wild Card game against Oakland A's next Wednesday night at Yankee Stadium. With the 12-1 win on Thursday, the Yankees (98-61) now hold a 2-game lead on Oakland (96-63) with just three games to play. The Yankees have three with the Red Sox at Fenway Park, while Oakland is in Anaheim for three with the Angels. 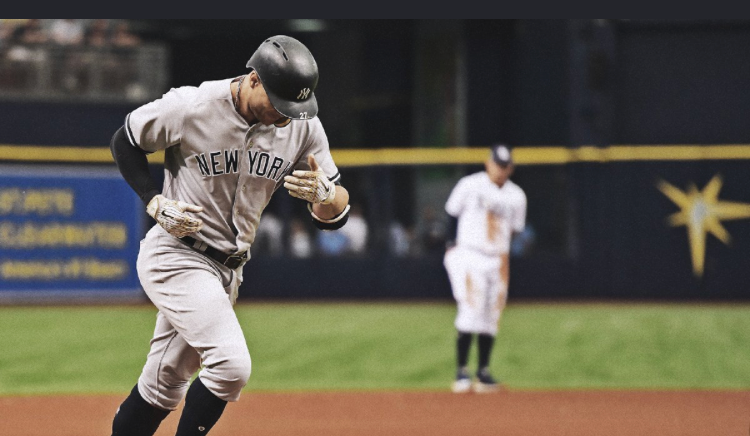 This series in Tampa was just what the Yankees needed after they sleepwalked through their series with the decrepit Baltimore Orioles last weekend, where they actually lost one of the three games and the two Yankees wins went to the wire. On Monday night, the Yankees did their first "opener" of the season, as Jonathan Holder got the start, as the Yankees used eight pitchers in their 4-1 win. Sonny Gray went two innings, but as is par for the course with how his season has gone, gave up the lone run to Tampa Bay in the fourth inning, although he did come away with the victory. That was because the Yankees broke a 1-1 tie in the fifth, thanks to the efforts of Brett Gardner. With Aaron Judge at second and two outs, Gardner laced a single to center to score Judge and make it 2-1. Giancarlo Stanton was up next, and he launched a rocket to left field, which scored Gardner from first to make it 3-1. This was what the Yankees have wanted to see from Gardner, and it couldn't have come at a better time, as the longest-tenured Yankee knows just what to do to get ready for October. On Tuesday night, the Yankees bats made this a laughter early in a 9-2 win. The Bronx Bombers put up seven runs in the third inning. Adeiny Hechavarria started it off with a solo home run, followed by a Luke Voit RBI double, and capped off by a three-run bomb from Gary Sanchez that made it 7-0 at the time. Sanchez went 2-for-4 on the night, with four RBI, his first big night in quite a while, as he has battled futility at the plate (.182 average) as well as his foibles behind the plate. Wednesday night was the one hiccup of the series for the Yankees, as Masahiro Tanaka coughed up a 3-0 lead in the first, and allowed four runs (three earned) on six hits in four innings, with just four strikeouts and a walk. This was Tanaka's final exam, in a sense, for a chance to start the Wild Card game, so it most likely will be J.A. Happ next Wednesday against Oakland. Tampa Bay hung on to that 4-3 lead until the eighth inning, when they rallied for four runs against David Robertson. The Yankees were down 8-3 heading into the ninth, but this is a Tampa Bay team that blew an 8-2 lead in Toronto last week. With Sergio Romo in to close it out for the Rays, the Yankees rallied, as Judge got an RBI single, Voit got a two-run single, and Stanton got an RBI on an infield single to make it 8-7. That was as close as they would get, as Tyler Wade flew out to right, and Miguel Andujar popped out to third to end it. On Thursday afternoon, the Yankees wasted no time getting to Tampa Bay starter Jaime Schultz. Brett Gardner doubled to open the game, and he then scored on a wild pitch to give the Yankees their first run. Later in the inning, Miguel Andujar hit a three-run shot to make it 4-0. This was Andujar's 27th home run of the season, and the three ribbies gave him 90 on the season, as he builds his Rookie of the Year case. The Yankees got three more in the fourth, as Austin Romine got an RBI single and scored on a sacrifice fly from Judge. A Voit RBI double, which scored Gardner, made it 7-0. In the sixth inning, the Yankees blew it open, as Gardner got an RBI triple, followed by a Judge sacrifice fly, a Voit two-run homer, and a Stanton solo shot to make it 11-0. The story of the frame, though, was when Andrew Kittredge threw a 93-mph fastball behind Romine's head. Romine glared at Kittredge, and Yankees starter CC Sabathia took a few steps out of the dugout and seemed to say something to the Tampa Bay hurler. Both benches received warnings. In the bottom of the sixth, Sabathia got his revenge when he hit Tampa Bay catcher Jesus Sucre with the first pitch of the inning. Sabathia and Yankees Manager Aaron Boone were immediately ejected, so that closed the book on amazing afternoon for the Yankee veteran. Sabathia threw five shutout innings, in which he allowed just one hit and no walks, while striking out five. He earned the win to improve his record to 9-7 and he lowered his ERA to 3.65. After C.J. Cron got Tampa on the board with a solo shot in the seventh, Stanton got his second of the day in the eighth to make it 12-1. Stanton now has 37 home runs and 97 RBI on the season. Voit went 3-for-3 with 2 RBI and 2 runs scored, and a walk. His average has bounced back to .331, nearly 50 points higher than it was a week ago. He now has 12 home runs and 30 RBI in his time with the Yankees. Gardner went 2-for-4 with an RBI, 3 runs scored, and a walk. For the series in Tampa, he went 5-for-14 overall, bumping his average up to .239. The Yankees finally showed a sense of urgency and the ability to fight back, and their reward is being on the precipice of clinching home field for the one-game wild card playoff.